Traditionally used as a ‘warming’ mineral, gold improves circulation, strengthens the immune system, stimulates the body’s ability to heal (particularly damaged tissues), and warms and ‘lights up’ the body from the inside out. It creates a gentle shield of protection, can cleanse and purify spiritual connection, and helps our essence shine through, allowing us to be the best we can be. Gold combats depression, lifts the emotions and instils confidence. It can be used as a Feng Shui remedy when placed in the wealth corner of the home to attract abundance. 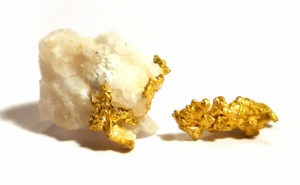 Pure gold is extremely soft and malleable, so thin specimens are easily bent or damaged. There are no health risks associated with this mineral. 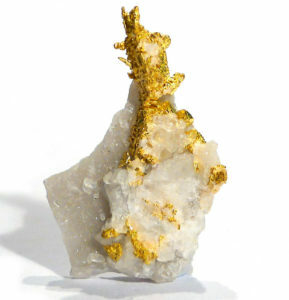 Gold usually forms in hydrothermic veins, where it is associated with quartz and pyrite (yes, “fool’s gold”). It is most commonly found as rounded grains, flakes or nuggets in placer deposits where it has weathered from its original rock, accumulating in river and stream beds – which lead to the tradition of prospectors panning for it. Crystals are frequently crude to rounded octahedra, cubes and dodecahedra, but more commonly occur as herring bone and dendritic twins. Gold does not bond easily, and is found almost exclusively in native deposits, occurring very rarely in gold-bearing minerals. It is highly inert, so doesn’t tarnish, and is very soft and malleable, so has been popular for use in jewellery and decoration for thousands of years. Gold has high electrical conductivity, so is used to plate contacts, terminals, printed circuits and semiconductor systems in the electrical industry. In addition, thin films (no more than an atom in thickness) are applied to satellite components, windows and spacesuit visors, and can repel up to 98% incident radiation. The Latin name for this mineral was aurum and Jöns Jakob Berzelius used “Au” to represent the element when he established the current system of chemical symbols. The Old English world “gold” (meaning yellow) first appeared in written form about 725 AD and may have been derived from gehl or jehl. It was known to alchemists as Sol (Sun). The earliest known use of gold was in Ancient Egypt and Mesopotamia around 6,000 years ago. Its use was decorative or as coinage, up until the late 20th century, when it began to be used in an industrial context (see the Mineralogy section above for details). Sodium aurichloride, a gold compound, is used in the treatment of rheumatoid arthritis.